Here's a breakdown of what to expect this winter in the way of temperature, precipitation, valley snow, valley wind and Mount hood snowpack. It's time again to look ahead to the winter season, and try my best to help you plan for it. Based on my research, and a little inspiration from the NOAA Enso Outlook, here's a breakdown of what to expect in the way of temperature, precipitation, valley snow, valley wind and Mount hood snowpack for winter 2018-2019. 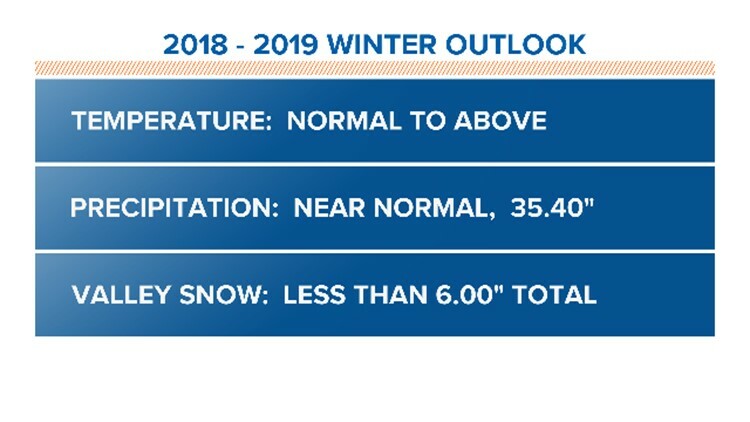 Valley snow: Less than 6"
The above conclusions are largely based on the NOAA Enso outlook calling for a weak to moderate El Niño this winter. I ran a set of winter seasons, dating back to 1950, that are on record with the Enso temperature range of positive departure expected in the coming months. I also ran a set of years in which the winter followed summers that had an extreme number of 90-degree days, and multiple-year patterns matching present-day weather. Below are my findings related to the above Winter Outlook. Eleven of the 15 winter seasons I consider as analog years showed near to above normal temperatures. In fact, the last cool year of consideration was the winter of 1979-1980, making a cool winter unlikely. The 15 analog seasons I used have an average of 35.43 inches, which is near normal (only slightly below). When looking at weak to moderate El Niño winters that follow hot summers, average precipitation for the complete water year is 35.36". My research shows a possible range between 25.87" and 43.03". Again, my number of highest confidence is 35.4". My highest confidence number for last season was 30.1" and PDX received 30.03"! Analog seasons show an average of 7.3" of snow on the valley floor. My research gives a 50 percent chance of winter snow in Portland being less than 3" and a 50 percent chance of winter snow being more than 8". Average snowfall following a hot summer is 5.4", (last winter recorded 7.6" and the winter before that saw 11.7"). The "kicker" for me is my finding that it is extremely rare for PDX to go three winters in a row with 6" or more of total snowfall each. In fact, the last time was from 1977 through 1980, and the time before was 1949 to 1952! The result is that there's only an 8 percent chance for PDX to receive 6" or more of total snowfall this coming season. So I'm calling for less than 6" of total season snowfall for 2018-2019. Six of the 15 analog years, or 40 percent, had a significant wind event. So there's an elevated chance of seeing a period of 60 mph wind gusts or higher this coming winter. In fact, in the analog winter of 2014-2015, which followed a hot summer, Dec. 11 had a south wind gust of 67 mph at PDX, the strongest wind since 1981. The event lasted 4-5 hours with 40-55 mph consistent wind speeds. It's worth noting that history overwhelming shows Portland's biggest wind storms take place in La Niña and normal Enso winters, neither of which is expected this year. Analog years show a 50 percent chance of a of normal snow year, so there is reason to be hopeful for a good season! But...the analog average is a snowpack of 66 percent of normal, and it's alarming that two of the lowest snowpack seasons ever recorded show up in my data set. The winter of 2014-2015 produced the lowest seasonal snow total on record, at just 25 percent of normal. Also in the analog years is the winter of 2004-2005, when the snowpack was 44 percent of normal. Mt. Hood Skibowl's front face was closed for much of both seasons. It's also worth pointing out that last winter's snowpack was 77 percent of normal, meaning a forecast of 66 percent of normal would only be slightly less snow than in 2017-2018. A little perspective shows a 25 percent of normal snow year at Timberline would dump a range of 240-290" for the season, depending on water content or weight of the snow, while a 100 percent of normal year may dump more than 600" at the lodge! 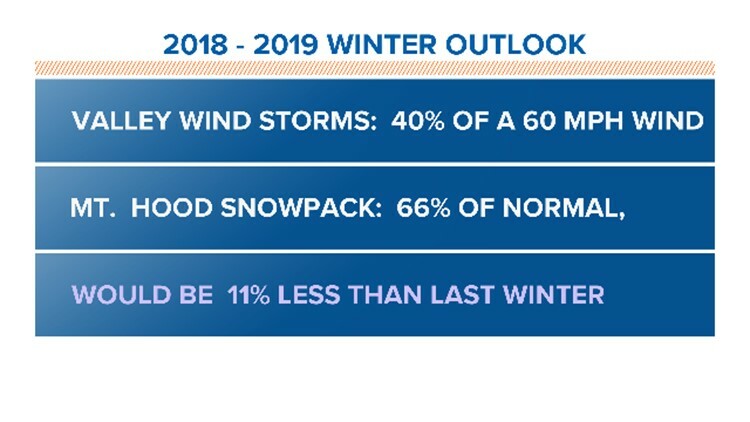 Lots of factors go into labeling a resort ski season as good or bad, including timing of big snowstorms, weekend weather conditions and overall freezing levels on the mountain. It's important to share with you my track record of accuracy for seasonal forecasting, dating back to 2000-2001: Overall, my seasonal outlooks average a 66 percent accuracy rating, and that's compared to an industry standard closer to 55 percent. Last winter my forecast was a success, largely because of my 67 percent confidence in calling for a below-normal water year, at about 30.1". PDX then recorded a water year (ending Sept. 30) of 30.03". Normal rainfall for the water year is 36.03". An error last season was my projection of below-normal temperatures, which was clearly incorrect. But I did correctly call for a quiet valley snow year, with no significant valley windstorms. I hope you find my Winter Outlook to be a valuable tool as you plan the winter season. As a forecaster, I live in the realm of vast weather possibilities. I'm often reminded that averages are a good method to determine odds of wet or dry, but sooner or later the entire data set range of what is truly possible comes true. Have a happy winter Season. Get the new Portland Weather app before severeweather hits!